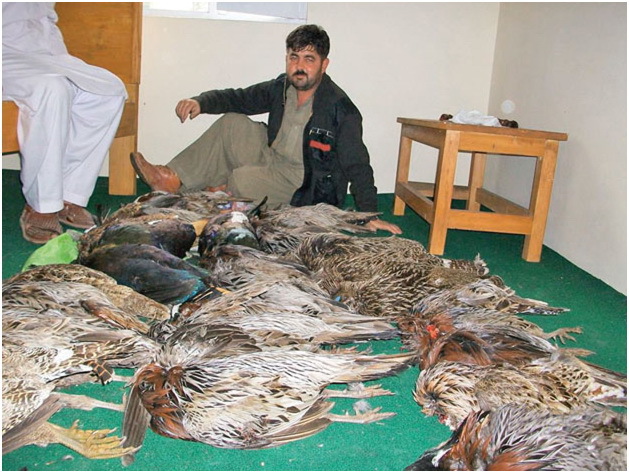 Akhunzada Hasham Hazrat, a government official from Dir, has been booked for hunting 28 rare pheasants and partridges in Kohistan. His crime was discovered after he uploaded pictures on to Facebook. His favourite website appears to be a Turkish one, mahmutogluav.com, dedicated to hunting wildlife and the best possible equipment to do it with. His Facebook account is flooded with trophy photographs from what appear to be many hunting trips. The photographs were discovered by Pakistan Tehreeke Insaf’s central vice president Malik Amin Aslam who went straight to the Khyber-Pakhtunkhwa wildlife department. Aslam, who is also a former state minister for environment, informed K-P Chief Conservator Syed Mubarik Ali Shah on July 21, 2014, and forwarded him the pictures. The office then apprehended the hunter and fined him Rs50,500 for killing 25 Koklass and three Monals. Hasham apparently told them he had hunted the bird elsewhere but according to Farooque no matter where he did it, it would still constitute an offence. “However comments posted on Facebook prove it took place in Kohistan,” added Farooque. 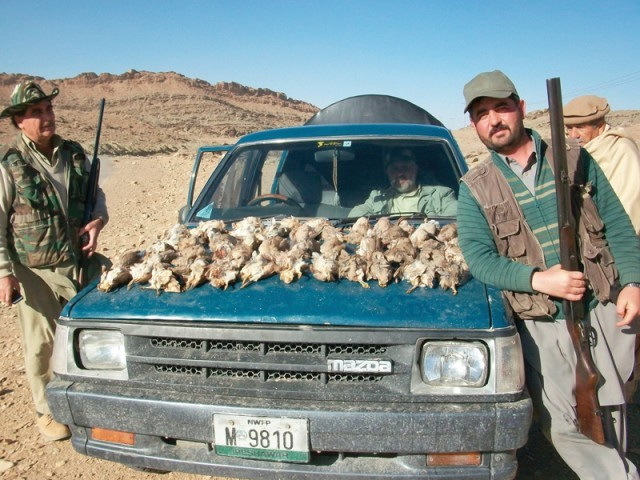 An official of the wildlife department said that pheasant hunting is completely banned across the mountain ranges of Khyber-Pakhtunkhwa but even then people hunt due to lack of enforcement. “Monals are found at an altitude of 8,000 feet or above with the Koklass pheasant and hunting them is prohibited,” he said, adding that the Monal was highly valued for its beautiful feathers. “Normally you are fined just Rs10,000 to Rs15,000 when caught and people willingly pay it,” he said. Shah fined Hasham and produced him in the court of the Timergara assistant commissioner. The case was compounded by the wildlife district officer for Timergara and Hasham paid the fine and removed the pictures. The office of the K-P chief conservator says eight pheasantries are working on the captive breeding of pheasants over a total of 5.16 hectares, according to experts from the Abdul Wali Khan University Mardan, Hazara University and Department of Wildlife in Buner, who were published in the International Journal of Biosciences in 2012. These are Dhodial Pheasantry, Bannu Pheasantry, Patanay Mini Pheasantry, Fizagat Pheasantry, Kotal Pheasantry Enclosure, Zafar Park Pheasantry, Safari Park Pheasantry and Kund Park Pheasantry.